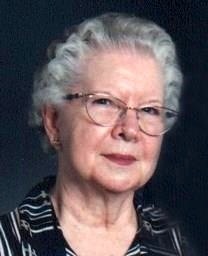 Mary Evelyn Sawyer Filkins, age 93, passed away peacefully on May 12, 2017 at Villa St. Frances. She was born July 3, 1923 in Circleville, KS to Mr. and Mrs. Edward L. Sawyer. She married and had two children, then divorced and married George Filkins. George adopted her two children. Mary worked making parts for the first spacecraft at Hisonic. She also created the first special needs class in Olathe. She was active in Girl and Boy Scouts. She was preceded by loved ones George Filkins (husband), Melvin Filkins (son), Mr. and Mrs. Edward Sawyer (parents), Leo Sawyer (brother). Survivors are Evelyn S. Davis (daughter) and 5 grandchildren LeaAnn, Troy, Lori, Larry, Carrie and 8 great grandchildren Michael, Cody, Natasha, Lainey, Zachary, Tyler, Austin, Ashley and 5 great great grandchildren Kylie, Kaitlyn, Ashton, Makayla, and Ella. Visitation is from 1-2 pm, with funeral services at 2:00 pm on Wednesday, May 17, 2017 at McGilley & Frye Funeral Home in Olathe, KS. Burial will follow at the Olathe Memorial Cemetery.